GIS Coordinates from Footage Calls using a PLSS Landgrid database. Footage Calls from GIS Coordinates using a PLSS Landgrid database. 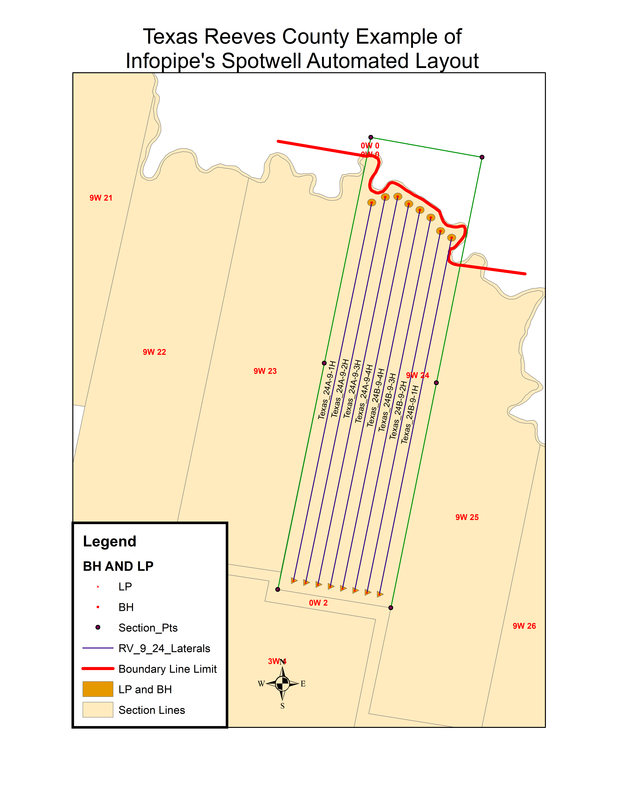 A number (N, user specified) Horizontal Well Layout information lines from Footage Calls of Starting (and Ending) Landing Point(LP)/Bottom Hole(BH) Points. LP and BH location point Shapefile. Excel CSV files with GIS Coordinates and Foot Calls for each lateral. We are demonstrating SpotWell(c) via Webex. System Requirements: Windows 10 and Access. Petra is registered Trademarks of IHS Corporation. ESRI is a registered trademark of ESRI. InfoShape is pending registration.Infopipe is a registered service mark.